When you first start prepping, it can seem so overwhelming. 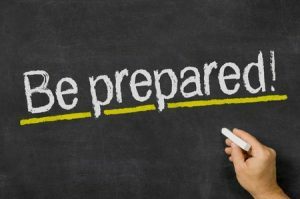 After all, there is an enormous amount of material that you can cover in trying to be prepared for every possible eventuality. For some, just the sheer number of possible disaster situations and solutions to each situation can make prepping seem like an impossible task. Set a goal and visualize it down to the most minute detail. This means, of course, that you are going to have to decide what you believe to be the most likely disaster and/or survival situations for which you’ll need to prepare. But, once you have figured this out, you need to think through the best solution that will work for you for these situations, and, then, get a clear picture of what this completed preparation looks like. If it is a bug out location, what does that location look like in every room and every aspect. If it is self-defense, what principles and practices have you worked with to be ready. A clear picture gives you something which you can work towards. Make a list of the reasons you want to accomplish the goal. Even though you start out motivated, a big project such as getting prepared can challenge your motivation when you hit the snags which will come or when you are in the middle of it. You need to remind yourself of the big reasons why you want to accomplish this goal so that you can draw on those reserves of energy and focus to finish this project. Break the goal down into smaller pieces and set intermediary targets — and rewards. Sometimes the key to avoiding (or working through) overwhelm is simply to take a big goal and split it into mini-goals that are small enough for you to not feel overwhelmed so that you can take action. But, once you have completed those mini-goals, you’ll still have your big goal completed. You just won’t be overwhelmed during the process. Have a strategy, but be prepared to change course. Realize that something will go wrong, but the point is to reach your end goal, not to take a certain path to get there. Be ready to change the way that you prepare in one or more areas. Just make sure that you keep moving forward to getting prepared. Get the help you need. As preppers, we often tend to be independent, but that doesn’t mean that we have or even should be isolationist. You can’t know everything. You can’t have prepared for every possible scenario. That’s why it can be useful to have other people with other specialties that you can depend on just as they will depend on you for your specialties. You can also take this point to mean that it’s okay to go looking for live training from someone who knows what they are talking about. Sometimes the short cut to reaching a goal is learning from someone else how they reached that same or a similar goal and copy their process. Pre-determine how you will deal with flagging motivation. It will come up. Don’t be surprised by it, but be ready to deal with it. One of the best methods that I have seen is to put prepping into your daily routine so that you don’t have to get motivated to do it; it’s just something you do without having any emotion (for or against doing it) tied to continuing to do it. Continually check in with your reasons for carrying on. Routinely review your reasons why you are prepping. It can be good to keep your reasons for prepping in front of you as a way of keeping your emotional energy (motivation) high. This can help you to push through to the completing the process. Now, maybe you’re looking at this list and thinking, Gerber isn’t even talking about prepping in this list, and you’re absolutely right. Gerber was talking about sustaining motivation and effort to achieve big goals, probably in business, but that doesn’t change the fact that the overarching process of goal achievement is the same regardless of what you are wanting to do. After all, being prepared is a big goal. You just need to apply this process towards the goals that important to you. Goals like keeping your family safe in a survival situation. I’ve had three bugout bags packed since Barry got elected into office and the number one thing you need is a means to start a fire(I have 7 ways) and # 2 is water purification tabs # 3 tarp (20×20) for shelter #4 means to gather food(gun,ammo, knife,traps etc.) This is just a start but remember that pounds = pain so keep the weight down to the absolute minimum.With the volatile political climate in this country being the way it is all I can say is good luck.